The good folks over at TTPM (Toys, Tots, Pets and More) just did a video review of Fort Boards building toys. They had a fun time with the construction set and they recommend it! The adult reviewers were able to build the cabin fort in about 20 minutes and we know that kids, ages 5 and up, can build even more creative structures too. As an occupational therapist in the public school environment, I work with many children with a wide variety of developmental delays, physical impairments, and varying diagnoses. The Core77 Design Award is one of the most prestigious in the world of design. Since 1995, Core77 has been an invaluable resource for the design community, providing a forum for active discussion, education, exhibition, and competition. And in this competition, Fort Boards was recognized as a notable entrant in the Open Design category. Occupational Therapist, Casey Halper, was kind enough to assess Fort Boards as an occupational therapy tool. We were pleased to hear that she recommends it. "After it stopped being their house, it became a restaurant for their stuffed animals to eat at. 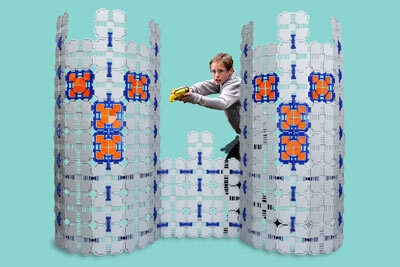 Then, it was transformed into a Video Game Fort...who knew?" "My kids are 9 and 11 and they went right to work building intuitively without even reading the instructions. At first they build together which was a lot of fun to watch. I love it when they play nicely together." "Fort Boards are a great new product that allows you and your child to quickly and easily build a fort of any shape and size from traditional forts to submarines, airplanes, and octopuses. Your imagination is the limit!" "It's so important to play... to play with your kids and to let them play alone. Let them be little, let them be excited. Some "toys" are a lot more than toys, aren't they." Fort Boards won the gold medal at the Mom's Choice Awards! Hooray! "As a parent I love that the fort boards keep my kids busy for hours, encourages creativity and teamwork, and they are easy to clean up and store. You have a great product!" These click together panels can be used to create anything your child imagines and you know how much that can be. Spaceship? Yup. Castle? Yup. Racecar? Yup. Anything? Almost. Easy to create and easy to clean up Fort Bords are perfect for any space. "Fort Boards allows kids to create custom forts in any shape they can imagine — say, a rocket, submarine or octopus — then break them down and start all over again." "That’s one of the things about Fort Boards, using any number of boards a variety of shapes and structures can be made, such as a small square for one or a large fort front enabling several to hide behind." "We love them! We use one set inside and one set outside! It is amazing to see how creative the kids are with the pieces!" "These are perfect for the kid that likes to build with blocks or Lego’s, but wants to create something bigger. I love that the kids can use their imagination to build something too. They are a perfect rainy/snowy/cold day activity and boredom buster." "What I really like about Fort Boards is that they simply snap together, and each piece can create multiple different angles for building, so you don’t need to sit and search for a certain piece to fit — they all work at any point in time by just adjusting the angle." Finding something fun that will keep them entertained for more than an hour can feel like a victory for us tiresome moms. Which is why I was stoked to learn about Fort Boards. A fun, creative way for your kids to have endless adventures indoors or outdoors. Seattle's Child Magazine checked out a preview of Fort Boards and let us know what they thought. We were glad to share the story of how these fort building kits were created and how these "giant Lego's" are perfect for builders of any age.